Counselling is a talking therapy, where you are able to openly talk about issues which are concerning you, in a safe, non-judgemental environment with a professional who will be able to support you in finding a solution or a path to understanding your reactions, behaviours, distress or confusion. Counselling is not a passive undertaking where you will be provided with the solutions to your problems, a skilled counsellor will enable and encourage you to make connections and take responsibility for your emotional and physical reactions and then help guide you to find resolution and a way forward. Therefore it is essential that you have a good rapport with your counsellor, this is why I offer an initial consultation prior to commencing therapy, this is an opportunity to meet and see if we are comfortable working together therapeutically. Once we agree to work together I then offer cycles of therapy that are either 6 or 12 weeks in length. These can be reviewed as we work together and I will work with you for as long as we agree it is beneficial to your development. Counselling helps you work through emotional difficulties and gain personal insight into yourself and this can help you to take responsibility and enable you to take control of your life. There is a great deal of truth in the cliché 'a problem shared is a problem halved' Counselling can help you make positive changes to your life in a supportive, safe, judgment free and confidential environment. 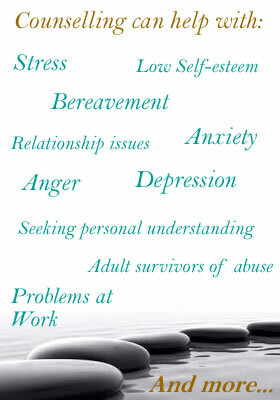 Depression, Anxiety and Stress ~ Loss of Confidence or Low Self Esteem ~ Bereavement and loss ~ Traumatic experiences ~ Emotional, Physical or Sexual Abuse ~ Work difficulties ~ Anger management ~ Relationships problems ~ Separation and / or divorce recovery ~ Self Defeating behaviours and patterns ~ Life crisis or transition and many other areas of life which may be causing you dis-ease, discomfort or distress.